For two decades, smart gun technology has advanced in fits and starts as wary investors kept purse strings tight and gun rights proponents at times fought its uptake. President Barack Obama's impassioned speech this week on gun control, however, could give the smart gun industry a boost; he called for smart gun R&D funding and opened up the U.S. government as a potential market for its adoption. Obama directed the Defense Department, the Justice Department and the Department of Homeland Security to conduct or sponsor research into gun safety technology. He also instructed the departments to "review the availability of smart gun technology on a regular basis, and to explore potential ways to further its use and development to more broadly improve gun safety." Smart gun proponents who've been developing the technology or lobbied the federal government in the past for funding applauded the move, saying it's the only way to move the technology to market. "We believe this is a game changer when it comes to the development of this technology," said Joel Mosbacher, a Rabbi from Mahwah, N.J. and national co-chair of Do Not Stand Idly By, a gun safety advocacy group. The group has garnered support from 82 mayors, police chiefs, sheriffs and governors around the U.S. who've expressed interest in smart gun technology. Do Not Stand Idly By has worked with the Metro Industrial Areas Foundation, a group made up of faith leaders and citizens, to push Obama to earmark at least $20 million for developing smart guns. Donald Sebastian, senior vice president for research and development at the New Jersey Institute of Technology (NJIT), which developed a smart gun, said investors have been shy about backing the technology because of market resistance. NJIT developed a smart gun that recognizes each gun owner's unique grip, and it was on its second generation of a prototype when a four-year grant ran out in 2012. Since then, the project has been mothballed. "It really is going to take federal dollars to move these things from conversation pieces and one-of-a-kind demonstrations to things that have been field tested and proven worthy of service," Sebastian said. "Once you do that, it takes the fear, uncertainty and doubt out of the conversation." 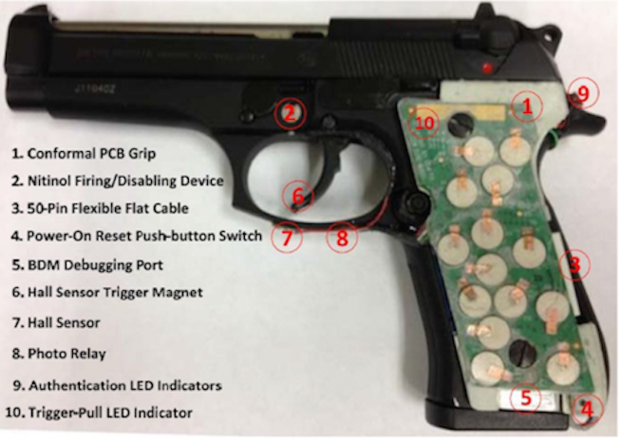 Smart gun technology uses RFID chips or biometrics, such as a fingerprint scanner or grip recognition, to release a locking mechanism on a weapon. The technology was initially developed to prevent police officers' weapons from being grabbed in a struggle and used against them. But, the military has also expressed interest in the technology for the same reason. From a consumer perspective, smart gun technology would deter anyone but an authorized owner from being able to fire a weapon. Asking a rhetorical question, Obama in his speech said, "If we can set it up so you can't unlock your phone unless you got the right fingerprint, why can't we do the same thing for our guns?" At CES this week, Identilock announced gun safety technology uses a fingerprint reader to unlatch a trigger lock. Once activated with an authorized fingerprint, the lock simply drops off the trigger, allowing it to be used. Germany-based Armatix tried to sell the first smart gun in the U.S. Its .22 caliber iP1 pistol debuted in one of California's largest gun stores. But it was quickly pulled from shelves after gun advocates pressured the store to stop selling it. The gun used an RFID chip in a watch to enable anyone wearing it to fire the weapon. Gun advocacy groups such as the National Rifle Association (NRA) and the National Shooting Sports Foundation (NSSA) have said they do not oppose smart gun technology. In a statement Tuesday, the NSSA said market forces should decide whether smart gun technology is adopted and noted it has never opposed its development. "We would continue to oppose mandates for this technology, particularly since there are well-proven existing methods to secure firearms, and firearms accidents are at historic low levels," the NSSA statement read. Oppenents' concerns over mandates are not without merit. More than a decade ago, New Jersey enacted legislation that requires smart gun technology once the state's attorney general determines a prototype is safe and commercially available. New Jersey State Senate Majority leader, Loretta Weinberg (D-District 37), who originally sponsored the New Jersey bill while serving in the State Assembly, has said she would consider repealing the law if, after doing so, the NRA would agree not to impede smart gun development. In 2014, Sen. Edward Markey (D-Mass) introduced the Handgun Trigger Safety Act, which would require all handguns manufactured, sold or imported into the United States to incorporate smart gun technology within three years of the law being enacted. "In the 21st century, we should use research and advances in technology to our advantage and save lives from senseless gun violence," Markey said at the time. The law has yet to pass. Markey applauded Obama's executive action, saying it's a step that he'd been fighting for with his own legislation. "Smart gun technology has the potential to save lives by keeping guns literally out of the hands of those who should not have them," Markey said in a statement. Mosbacher said that when he has spoken to smart gun designers, most believe it would only take a few million dollars to go from prototype development to a marketable weapon, so $20 million would fund several technology development efforts. "Which is peanuts in comparison to the federal budget," he said.